“Asakusa Sushi Ken” offers wild local fish from the morning and halal food. The counter seats on the first floor are always full. The reservation of these seats is unfortunately not accepted at dinner time. It will be a great entertainment to look over the counter! Good quality wild-caught fish comes from the market every day, the delicate work can be seen from regular Nigiri menu, preparations for the recommendation of the day, to sushi, sashimi and sushi rice. With the motto that "a top-class is to cook what guests are asking for", the manager responds to all different customer requests and challenging needs. It is the possibly only restaurant to offer Halal food in Asakusa, or even in the whole Tokyo. While keeping the craftsmanship, the chef can respond flexibly. Price, taste, needs... There are many good reasons to have Asakusa Sushi Ken as your favourite restaurant. 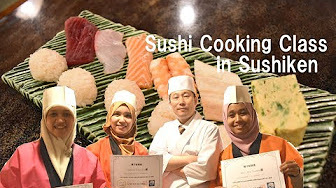 ■■　Mr. Masao Ito　■■ The chef studied various art of cooking and hospitality during the training at several sushi restaurants and seasonal cuisine restaurants. He joined Asakusa Sushi Ken since its opening in 2002 and became restaurant manager. ■Table and chair-style on tatami mats on the second floor■ You can take off your shoes to sit comfortably at the table. Ideal for families and business dinner. A semi-private room for up to 8 people can be provided. It can also be suitable for special occasions and anniversaries. ■■　Sushi toppings case　■■ Sushi toppings are cooled down by laying ice underneath, this traditional manner keeps fish fresh without drying. As the showcase is on the same level as the counter table, you can trust the chefs’ skills.